My father just told me that my grandfather use to bring paint chunks home from the paint plant he worked in. My grandfather use to make rings and things. Remember to practice and use shop safety – use protective eyeglasses, dust masks and gloves. Know how to safely use the equipment before you start. No loose clothing - hair - objects around moving items. Remove your rings while working. Paint chunks – I started with a piece approximately 3 inch by 2 inch by about ½ inch thick (piece shown is an example of the layers). note I used power wheel sanders). Close the paint chunk in the vise. I wrapped the paint chunk with a towel to reduce the chance of breakage (from the vise). approximately 1 inch by 1/2 inch by 3/8 inch - each. Just a note: take your time the paint can be brittle and break or crack. I started by using the 100 grit wet paper. The 100 grit wet paper takes a lot of material off, this will shape the piece (use lots of water while sanding). Once I got the general shape I wanted; I moved onto the 220 grit wet paper. The 220 grit wet paper will still shape the paint pieces a little and start the polishing process. I then went onto the next sanding level with 400 grit wet paper. The 400 grit paper does more polishing with little material removal. I used a buffing wheel with polishing compound to give the smaller pieces a gloss. Car polish on a power wheel works well. I found the new clear spray-on car polish does just as nice of a finish without a lot of work. the eye loop diameter. I drilled a ¼ inch deep hole in the paint pieces. I used the wire cutter part of the pliers to cut down a metal eye loop to create a bail. I cut approximately ¼ inch down from the bottom of the eye. I use pliers to force the cut down eye loop into the paint pieces. I put an 8 mm ring onto the eye loop and then I strung the necklace through the ring. Just wanted to share some more pictures of paint chunk pendants – necklace. The last four show the fronts and backs, either way these paint chunks look great. Those look really cool, I've seen this material before but under the name of Fordite, just random information I wanted to share. 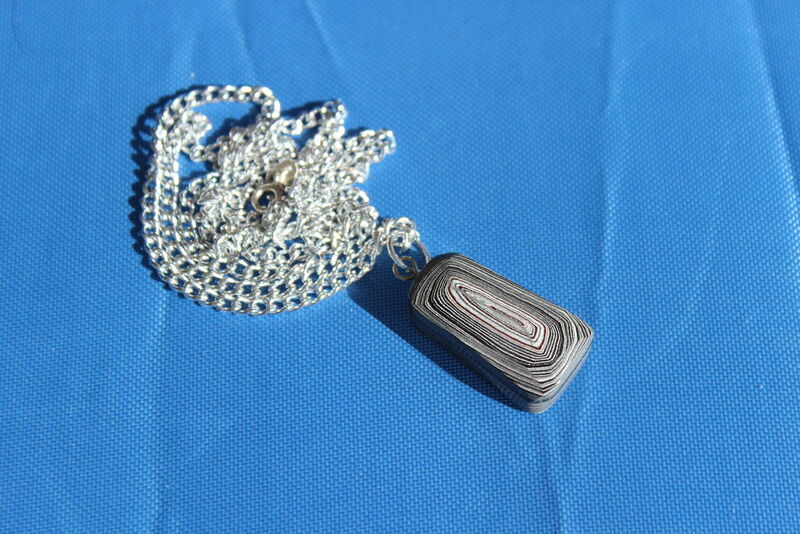 Yes I also have heard it called Fordite. Thanks for sharing this is why I like Instructables so much; the sharing of ideas and information. I wanted to be neutral in what I called it. I would really like to get some motorcycle paint chunks or other kinds; I would think there are some wild color combinations in other paint plants. Thank you for viewing my instructables. I have thought of selling them until I found out how much the base material costs. It is sold by the gram. I was lucky to get a few pieces to try. It is so popular at the club I belong to; some one traded opal for pieces of paint chunk. So, I wish I could help, I enjoyed making them and I have moved onto something else. Just a side note: I have since learned that the paint embeds into your grinding and buffing wheels. So, I am not a big fan anymore. I was working on a special stone and it came out covered in paint from the wheels. I probably was no help, but this is what I have to offer. OH, the man who sells the paint chunks does not use a computer. This looks so great! I thought they were geodes when I first glanced at the project. These are lovely. I've always wanted to obtain some layered auto paint to play with. Any chance you'd sell some paint chunks to someone not lucky enough to live in Michigan? I have no more paint chunks. I have moved on to other materials to work on. If I get some more chucks, I will let you know. thanks, This was a fun project for me. You made my day with your nice comments. Great idea; that would make a nice combination. Woa, I've definitely never seen something like this before! Might sound odd, but I look at them every morning. Remember some paints contains loads of heavy metals or other harmful materials. Always varnish rings, bracelets and things you make, that are meant to have skin-contact. Especially with found materials. Some woods are toxic too, so read up on it. And varnish with a safe varnish if in doubt. Thank you for your comments; my wife has recently become skin sensitive to items she has been around her entire life. So one day, her shampoo was good, the next she breaks out. I try to cover most everything in American made nail polish. This time I used car wax, which could be an issue in itself for some people. Thank you again for good information in your comment. Loved it, at first I thought of it as some kind of volcanic rock. Thank you for sharing.